I'm very happy to say that the writer of Victory Decision, Agis Neugebauer, took the time to write some Early War supplements for his ruleset. The most recent additions to his collection of Army Guides/Field Manuals are the Early War German infantry and the Polish Army books. This review will focus on the Polish Army book. As I've said before on several occasions I find Victory Decision to be working quite well if you want to play a game on a smaller "platoon" scale rather than "company sized" battles of Flames of War. The book includes Polish Rifle, Motorized, Cavalry and Motorcycle platoons and offers units mounted on horses, trucks, motorcycles - fighting on foot and most important of all, the rulebook supports a lot of vehicles and tanks that often get overlooked but which the Polish army actually had at their disposal. Such as the R35 and 9TP tanks and the older and heavier armoured reconnaissance vehicle wz.29 Ursus. The book also includes profiles for the AT guns and artillery, howitzers and Bofors AA guns. Just like with the main rulebook and other supplements you get unit profiles for both single and multibased infantry, so no one gets left out. As usual you get the PDF book in two copies, one full color and one “printer friendly” if you buy it through Wargame Vault. There isn’t much of historical background except for some descriptions in the unit profiles, and there is also not much “filler material”. The book is completely about new profiles for the Polish army. 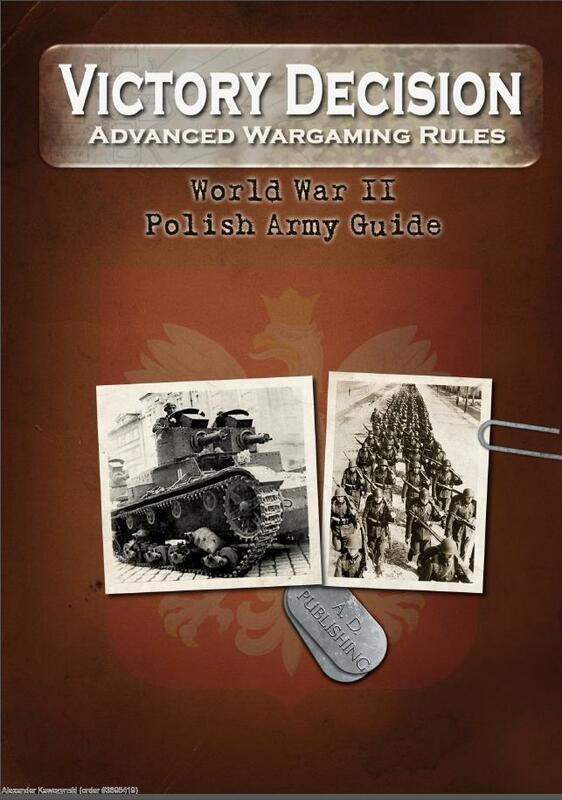 Not much more to say, this is a welcome addition for anyone playing Early War Poles and who want to try out a new set of rules with their miniatures, or people already playing Victory Decision who want to try out the Polish army in Early War.